HQserv Review 2019: Is HQserv a Good Hosting? HQserv is an Israel-based website hosting provider with dedicated hosting, virtual private servers, and colocation services. Founded in 2008, HQserv is a small Israel-based website hosting provider. They currently host over 100 servers and have over 90 customers. Their website and support is available in both English and Hebrew. I really like the Service Level Agreement HQserv has put in place. They make several commitments to their customers and offer compensation if they don’t meet them. For example, in the rare event of a system failure that causes a service outage, the customer will be credited the equivalent of one day’s worth of hosting fees for every 30 minutes of downtime. They also commit to replacing any faulty hardware within two hours of determining the cause, or to providing compensation if they’re unable to do so. Another great benefit of HQserv is their flexibility. Not only do they allow you to customize your plan when you are checking out, but their customer service was also exceptionally helpful and offered me products and packages that were not advertised on the website. For instance, they don’t typically offer shared hosting, but they were very happy to accommodate my request when I contacted them. It’s easy to get set up with HQserv. You can pick your plan, customize it, and then pay for it online via their website. 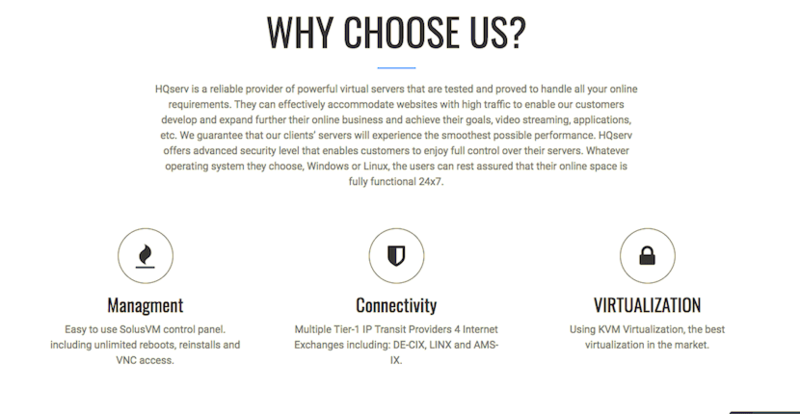 They’ll get you set up with your dedicated or virtual private server within 24 hours. Due to the customization options, the checkout page is fairly complex to understand and isn’t suitable for beginners. Compared to other Israeli web hosting providers with enterprise-grade solutions, HQserv’s prices are competitive. They also compare well with international providers, after the initial discounted period that larger companies often offer for long-term contracts. That said, HQserv doesn’t offer any discounted rates for purchasing longer terms. You can choose to pay monthly, quarterly, semi-annually, or annually; however, the price per month remains the same. You can upgrade or downgrade at anytime. They offer a seven-day money back guarantee, but there are no free trials or freemium plans. They have great customer service. In the event of a technical issue, you can contact telephone support 24/7 and speak to a dedicated service engineer. You can also contact live chat Sunday – Friday 9am – 6pm GMT +2. I found their operator on live chat very helpful and efficient. He spoke in excellent English and was able to quickly and easily answer all of my questions. Unfortunately, they do not have a large knowledge base for customers. If you encounter any issues, the best way to get support is by contacting HQserv directly. This is a little inconvenient as ideally I’d like to research and implement solutions without having to contact customer support. That said, the quality of their customer support means you don’t have to wait a long time for assistance. HQserv may be small, but that allows them to set themselves up as an affordable but premium website hosting provider based in Israel. They provide single-tenant infrastructure with Tier I network providers. Wondering how HQserv stacks up against other Web Hosting companies? Enter any other Web Hosting company and we will give you a side-by-side comparison.